What Does Humility Look Like as a Personality Dimension? Posted March 20th, 2017 by Mike Boyes & filed under General Psychology, Industrial Organizational Psychlology, Motivation-Emotion, Personality. Description: If I told you that an under-researched personality dimension involves humility what comes to mind? What would distinguish a humble person from a non-humble person particularly in terms of their own thoughts, beliefs and ideas? How might the interpersonal interactions of people high on this dimension differ from those of people low on this dimension? Once you have your thoughts on this in order on this question read through the article linked below to see what researchers looking at humility have to say (or rather what their data suggests). Source: Intellectual Humility Augments Nonpartisan Open-Mindedness, Christopher Bergland, Psychology Today. Intellectual humility, according to the researchers whose work was discussed in the linked article involves a clear view of one’s own beliefs, views and abilities along with the ability to negotiate and discuss issues with people whose views and thoughts are different than one’s own. More that openness to experience (a core Big 5 personality dimension) humility involves working closely and well with others and working past apparent biases and differences and it is equally distributed among conservatives and liberals. Essentially it seems to involve seeing others as possible collaborators rather than as opponents. 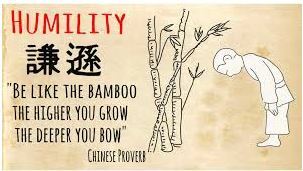 Interestingly, it seems humility can be trained. If that is so perhaps we should send a few such trainers to anywhere partisan politics are being practiced (like, gee, Washington maybe?!!). How does humility relate to other personality variables such as openness to experience or stability? What are some of the situations or social places where humility might be an important personality dimension? Mark R. Leary, Kate J. Diebels, Erin K. Davisson, Katrina P. Jongman-Sereno, Jennifer C. Isherwood, Kaitlin T. Raimi, Samantha A. Deffler, Rick H. Hoyle. (2017) Cognitive and Interpersonal Features of Intellectual Humility. Personality and Social Psychology Bulletin, 2017.